Wow, Little Collins is busy. This Melbourne-inspired Midtown shoebox is not as spacious as other Australian cafes in NYC (think, Two Hands) with seating for just 10 and a line out the door come lunchtime. But the menu instantly brings a smile to your face: there’s Convict toast (with Vegemite) on the brekkie menu, and a charcoal chook sandwich. But everyone’s ordering the avocado toast and the schnitzel sandwich, and you should too. 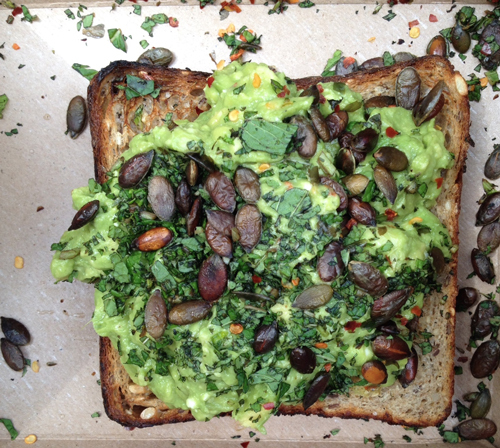 The avocado toast is a thick slice of multigrain bread with smashed avocado, dried mint, pepper flakes and toasted pepitas. For avocado toast purists it might come adorned with too many embellishments, but it makes a filling lunch. The more substantial schnitzel comes on a baguette with hummus, pickles, onions and chile. There are a few Middle Eastern flourishes on the menu (including today’s lamb gyro special) so while Little Collins might not be as cosy as other antipodean outposts, the food is definitely a nod to multicultural Melbourne.